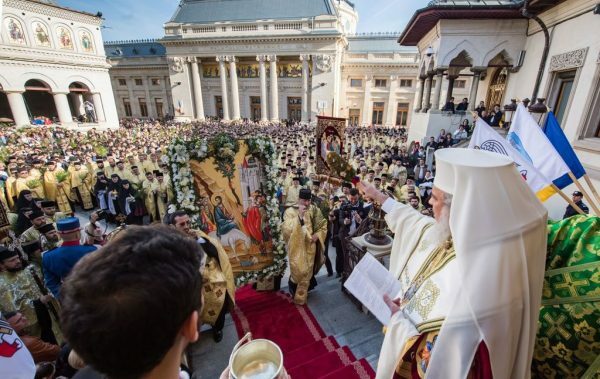 Thousands of believers are expected to take part in the traditional Palm Sunday Procession across the streets of Bucharest that will take place on the eve of the Feast of the Entry of the Lord into Jerusalem, April 20, 2019. It has become an annual tradition for Romanian hierarchs, clergy, monastics and believers to carry palms and icons in procession remembering the triumphal Entry of our Lord Jesus Christ into Jerusalem, marking the beginning of His Passion. This year, the procession will begin at Radu Voda Monastery at 16.15 p.m.
Believers will be welcomed at the Patriarchal Cathedral by His Beatitude Patriarch Daniel at 17.45, where prayers will be offered and His Beatitude will deliver a speech.